A portrait of a colonial official seated on the root of a shade tree with other Mandari men seated on low bench seats nearby. This may well be Paul P. Howell, Jean Buxton's cousin, who was in the Sudan Political Service 1938-55. 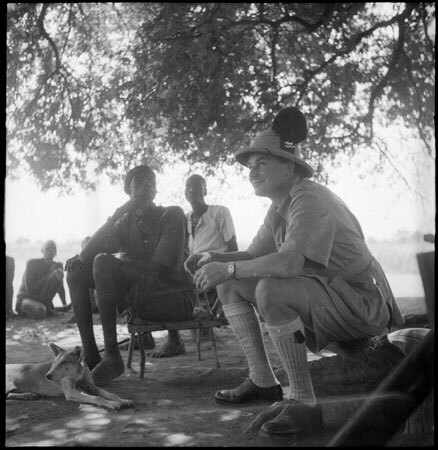 Besides being involved in the Jonglei Canal project, Howell wrote a doctoral study in Nuer ethnography. Morton, Chris. "Administrator in Mandari" Southern Sudan Project (in development). 03 Jan. 2006. Pitt Rivers Museum. <http://southernsudan.prm.ox.ac.uk/details/1998.97.202/>.